1981 - Dr. Norman Burgess, while at Mount Royal College, establishes The Calgary Fiddlers Association. 1982 - The Calgary Fiddlers Association officially incorporates as a non-profit organization. 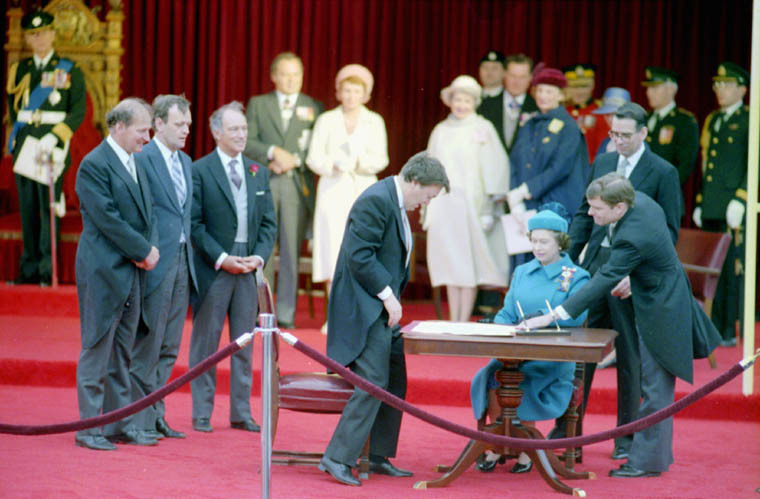 1982 to 1986 - The Calgary Fiddlers rapidly become renowned for their energetic style and are requested by various levels of government to perform for special occasions like the signing of the Canadian Constitution, in Ottawa. 1984 - The Calgary Fiddlers participates with the Calgary Philharmonic Orchestra in a live show broadcast from the Jubilee Auditorium as part of Alberta's 75th Anniversary Celebrations. 1986 - The first Calgary Fiddlers recording, "Fiddledaze", is released. 1986 - Dr. Burgess hands over the reigns to John Crozman who works to grow the spirit and presence of the Fiddlers. 1987 - The CFs tour internationally to Scotland. Calgary, Alberta, takes its name from Calgary on the Isle of Mull, on the west coast of Scotland. Fiddling has deep roots in Scotland as it does here in Calgary. The tour connected Calgary with Scotland once again and the Fiddlers with the roots of the music. The CFs has been welcomed back with open arms each time they go. 1986 to 1989 - The Calgary Fiddlers continue to tour nationally and gain tremendous recognition: Josephberg, AB; Edmonton, AB; Maple Creek, SK; Toronto, ON; Riverview, NB were just a few of the stops as the Fiddlers play over 50 shows a year. 1988 - The Calgary Winter Olympics establishes the Olympic Arts Festival and the Calgary Fiddlers welcome groups from all countries participating in the Olympics. 1988 - The Country Music Association of Alberta votes The Calgary Fiddlers, the "Best Young Talent". 1988 - 1989 The Fiddlers received new uniforms and are proud to show them off. 1991 - The Fiddle Club Books and CDs were designed to help students with the basics of fiddling. The books are still in print and in use today. March 1997 - Donna Turk, CF Alum-1982-1988, joins the CF Association to be Artistic Director of The Bow Valley Fiddlers, which started in 1991. The BVF group was in response to demand for a younger educational component to The Calgary Fiddlers and now has approximately 70 students per year. May 1997 - Nolana Baillargeon, CF Alum-1986-1989, takes over as the Calgary Fiddlers Artistic Director. A year later, Nolana becomes the Executive Director of the entire organization. June 1997 - Robyn Albright takes on the Accompanist role for both The Calgary Fiddlers and The Bow Valley Fiddlers. July 2005 - The Calgary Fiddlers are asked by The Canadian Embassy to participate in the First Annual Children's Festival in Seoul, Korea. May 2006 - The Calgary Fiddlers Association celebrates 25 years of entertaining the world, with a large concert and cocktail event at the Jack Singer Concert Hall. The Concert celebrated Alumni of the organization alongside the talented CFs and BVFs of the day. May 2006 - To recognize the 15th Anniversary of the Bow Valley Fiddlers, the Association sponsored new uniforms featuring the official Calgary Tartan. July 2008 - The Calgary Fiddlers tour Ireland and perform to enthusiastic crowds. They have the privilege of studying with Ms. Theresa Bourke formerly of Lord of the Dance. December 2009 - The Annual Fiddle Fantasia Christmas Concert at the Jack Singer was proud to host 500+ seniors whose tickets were sponsored as part of a Community Spirit Grant. January 2010 - The Calgary Fiddlers tour Florida to loving and adoring fans as they have every other year for the past 10 years.